Will Residents Use The New Atlanta Streetcar? A crowd gathers downtown for the public opening of the Atlanta Streetcar. 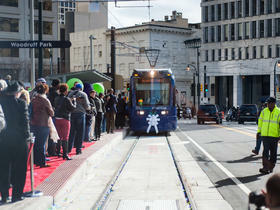 After nearly three years of construction, the Atlanta Streetcar Tuesday officially opened for passenger service. City officials say it will help attract tourists and economic investment. Still unclear is whether residents will actually use it. 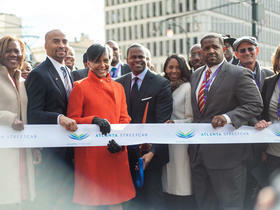 A launch ceremony took place near downtown’s Woodruff Park in front of hundreds of onlookers. The Streetcar runs from Centennial Olympic Park to the Martin Luther King Jr. memorial site. Riding will be free for the first three months and a dollar per ride afterward. It was originally slated to open 18 months ago but construction issues and safety concerns delayed the project. A relieved Atlanta Mayor Kasim Reed said he was excited to see it finally online. The city will run two of the four streetcars at any one time. That means a wait between streetcars of about 15 minutes. Old Fourth Ward resident Caler Gordy plans to use it and believes others will, too, despite the wait times. Gordy and others, however, acknowledged that much of their enthusiasm for the project is based on an assumption of future expansion, in particular to the Atlanta BeltLine. Sheree Canes works in the area. To help attract residents, Mayor Reed wants to knock wait times down to 10 minutes. He says he’s looking for additional sources of funding to make that happen. In the meantime, he thinks the Streetcar goes a long way in creating a more walkable, vibrant downtown. Last year, the BeltLine board, which includes Reed, approved about $5 million to study streetcar extensions into Georgia Tech, around Piedmont Park and the Eastside Trail, and other areas.